WINTER... TOO LONG WITH US? My husband Bob and I have never made a big deal out of such "obligatory" holidays as Valentine's Day. Better to impulsively surprise each other on any ordinary day, with something special for no societally dictated reason. However, on a Valentine's Day several years ago, I did receive a gift of sorts from Bob. 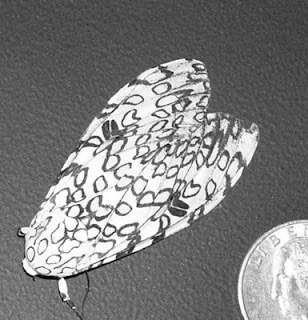 He had walked down through the snow to the barn, for one reason or another, and stumbled across this giant leopard moth which had descended into its permanent "sleep." Its wings were more open when Bob first presented this "love bug" to me and many of the naturally stenciled patterns on the insect's wings were more visible than in this later photo. They were little hearts!! You may think a dead bug is a weird gift to receive from a husband, but I understood the thought behind it, and he was right! I did enjoy sharing this unusual "treasure." Happy Valentine's Day from R.A.T. (Rose About Town). Be loving to each other, but forget the artificial hoopla.